Blowhorns are fun, aren’t they? They fill the air with loud noises, scaring the pants off whatever unlucky souls happen to be nearby. For those who love to prank, but are lazy in the ideas department, a blowhorn is a quick fix. Jokes aside, no reasonable human should wield that kind of volume. In fact, when you’re trying to engage sorority donors, getting loud about it can often cause the opposite effect—alumnae will cover their ears and run away. Has anyone ever tried to convince you of something by screaming in your face? Did that screaming convince you, or did you just get angry and ignore the person? Hostile or aggressive approaches tend to make people view you as a jerk, rather than focus on your message. Instead, effective messaging has a lot to do with how sincere your efforts are at natural engagement. Pennington & Company is here to tell you to put down that blowhorn. You don’t need a loudspeaker to get your message across. Here’s how to Engage Sorority Donors and Keep Your Treasury Filled. 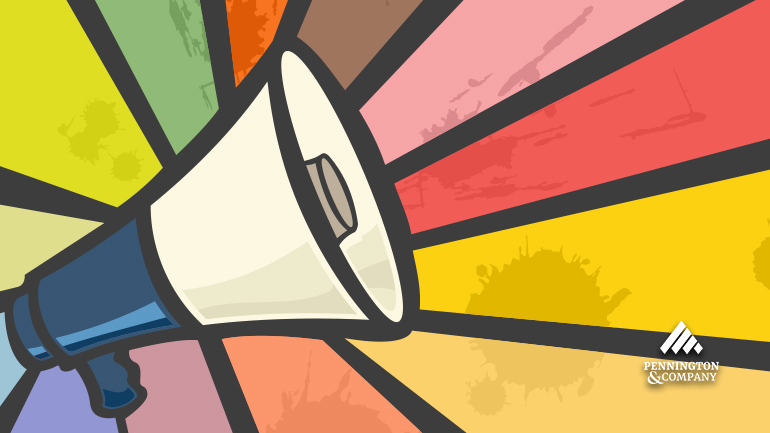 When it comes to managing a capital campaign, shouting doesn’t work. Part of the reason for this is that you’re only soliciting donors aggressively because you don’t engage them often enough. The more often you engage sorority donors . . .
the more easily you’ll reach fundraising goals . . .
and the less difficult soliciting donations will be. Scheduled fundraising campaigns—as opposed to infrequent fundraising efforts—have proven more effective at garnering higher gift levels across the board. What does this mean for you? Essentially, you must think small to reach big goals. And if you and your donors are used to pop-and-run fundraising, you’ll have to overhaul and get everyone in line with a new system. But it will pay off. Trust us. Start by not fixating entirely on the big numbers. Of course, if you’re renovating your sorority house or building capital for some other major, long-term project, your goalpost is much higher than other fundraising needs. But the concept here is the same. Approach alumnae donors with the long-term effects of their donations over multiple years. Keeping fundraising constantly in the conversation with donors, and favoring scheduled, recurring gift commitments over infrequent, one-off campaigns, will pay dividends. In a fundraising landscape where donors are less engaged and harder to come by, that’s a massive benefit to your chapter. Side benefit: You can still garner one-time large gifts in addition to targeted annual gifts for your campaign. A great strategy will sample from both of these buckets. Easier said than done, right? Maybe. But maybe the problem isn’t just donor engagement. It could be that chapter-alumnae engagement is disjointed in general. This can lead to a lot of finger pointing at the undergraduate sisters for poor engagement management. But that’s really not fair, nor is it productive. Sure, sisters must engage alumnae if they expect the support of their members. We’re with you on that. Yet alumnae also play a crucial role in fostering and managing their relationship with the chapter. "If you’re looking to keep the coffers from falling bare, alumnae should lead the charge." This means that alumnae will need to keep a close relationship with key undergrad officers, such as the president, alumnae engagement chair, and treasurer. It’s a good idea to invite these officers to attend alumnae meetings, when possible, or to hold your own private meetings to discuss fundraising strategies. Your proactive approach will reinvigorate the undergrads to step up their efforts as well. If you’re looking to keep the coffers from falling bare, alumnae should help lead the charge. The most surefire way to get yourself a one-time-only donor is—wait for it—to waste her gift. You’ve wasted vital time, energy, and resources of the chapter and alumnae volunteers. You’ve shown donors that engagement doesn’t benefit the chapter properly. Donors will be disappointed that their money doesn’t go toward goals that interest them. Undergrads will believe fundraising takes too much effort and doesn’t help them enough. Apathy can cripple the efforts of undergrads, alumnae volunteers, and donors. Fundraising will fall short of goals. You can figure out where this road leads. Take the nearest exit by putting a lot more thought into what chapter projects warrant engaging sorority donors. Of all the project ideas, which are the most pressing? What feels most important to undergrads and alumnae? What projects will the chapter get the most immediate traction from? What’s more of a backburner idea and can be delayed or cut? You can find answers to these questions by going out and asking your potential donors. Electronic surveys are a quick way to get a feel on the fundraising pulse, but you should also sit down with those most likely to donate and get their take. Ask questions, but also listen and give feedback. You can also demonstrate good financial management to donors by using sorority budgeting software such as OmegaFi’s Vault. Engaging sorority donors may have you wanting to shout from the rooftops, but sometimes using your inside voice can take you further. Pennington & Company loves helping sorority chapters achieve their fundraising goals and engage donors meaningfully and efficiently. If you’d like to know more about our services, get in touch with us here or call directly at 785-843-1661. What questions do you have about sorority donor engagement? Let us know in the comments below.